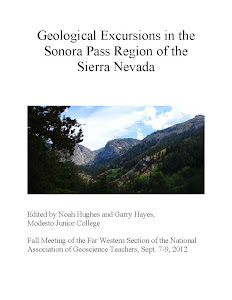 Geotripper: The Sierra Beyond Yosemite: Wait! Is that...a Glacier? The Sierra Beyond Yosemite: Wait! Is that...a Glacier? People who visit Yosemite Valley often think about glaciers. 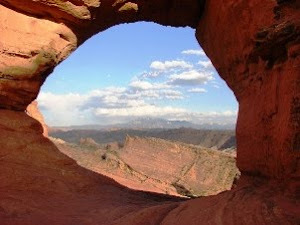 Even those with no geologic background quickly become aware of the role of glaciers in forming the valley, but the thoughts are often of the past. It's been 11,000 or 12,000 years since any glaciers have been in the bottom of the valley, and it's been around 800,000 years since glaciers filled Yosemite Valley. The glaciers seem a part of the distant past. 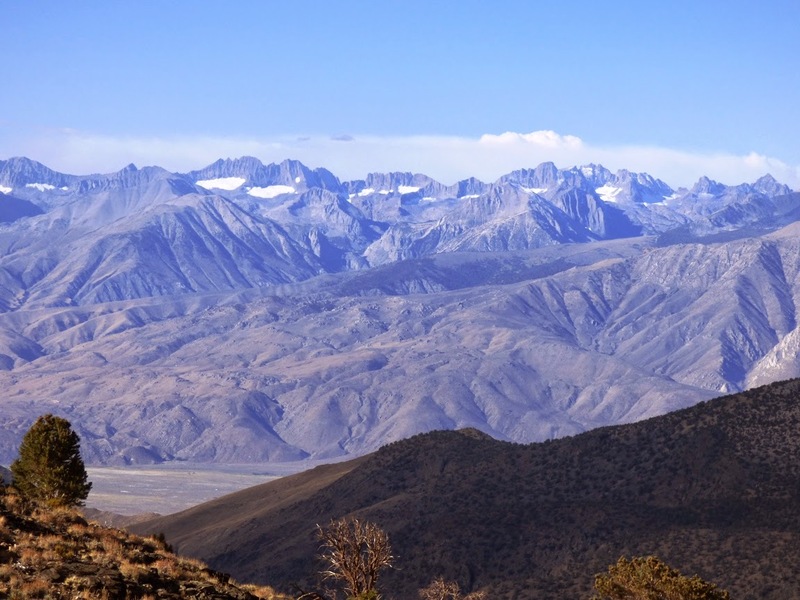 When we reached the crest of the White Mountains on our fall field trip, we could see across the Owens Valley to the highest ridges of the Sierra Nevada. It was late September in one of the driest years ever recorded in California. And yet...there was still ice in the high country. How could any snow still be left after one of the hottest summers on record? A closer look through the zoom lens told the story. The isolated patches weren't snow at all, they were ice, and the cracks and fractures tell us that the ice has been moving. In other words, these are glaciers! 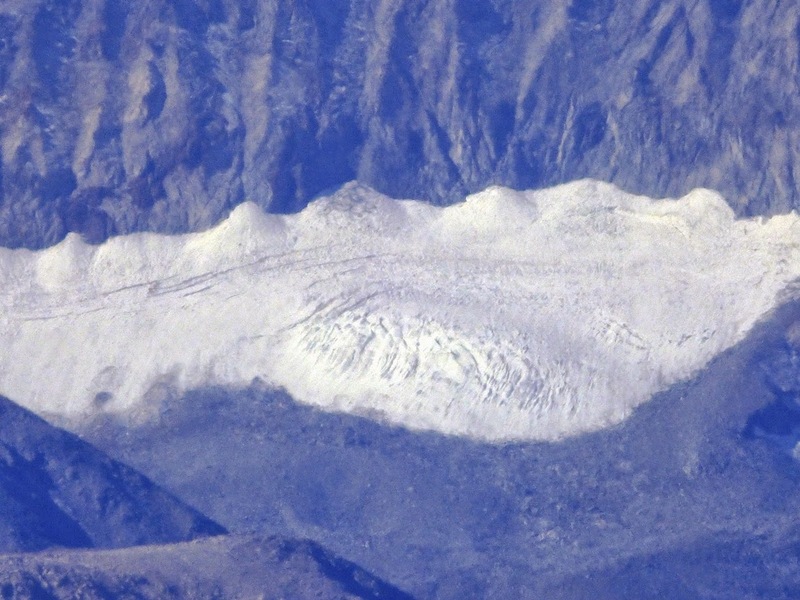 Glaciers would not seem to be a California phenomenon. Too much sunshine, too many droughts, it just doesn't seem to be the kind of place where snow could accumulate and compress year after year, decade after decade, until the frozen mass starts to slip under the weight of 100-200 feet of ice. Indeed, the permanent snowline would be in excess of 15,000 feet or more, and no peaks in California are that high. But given certain areas with cold "microclimates", glaciers have persisted in the ranges, in the shaded hollows of the highest mountains where the sun almost never shines. 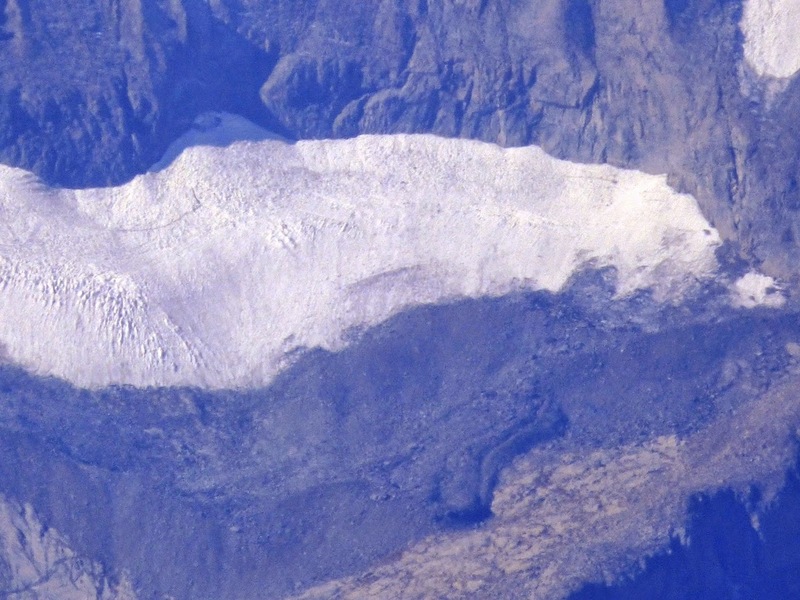 According to the U.S. Geological Survey, there are nearly 500 glaciers in the Sierra Nevada, but none of them is very large, the biggest being only a mile (1.6 km) wide and half a mile (0.8 km) long. The total area covered by glacial ice in the Sierra is only about 19 square miles (50 square km). 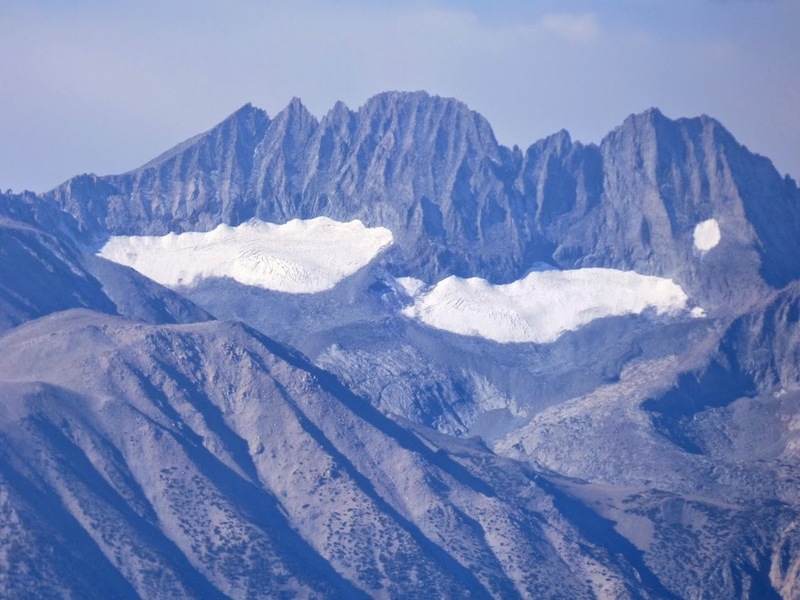 We were looking at some of the largest remaining glaciers, those that persist beneath the peaks of the Palisades Crest, a group of 14,000 foot mountains on the east boundary of Kings Canyon National Park. It is known that there was a much warmer period several thousand years ago following the last major ice age, so these are not remnants of those Tioga stage glaciers. Small glaciers like these would have melted completely away. There was a general worldwide cooling event in the 1700s, the so-called Little Ice Age, and it was in those decades that these glaciers accumulated. If you want to see the remaining glaciers of the Sierra Nevada, make your plans now. Since the early 1900s, the glaciers have been shrinking, and they have already lost 50-80% of the volume that existed at the time of their discovery. Glaciers are one of the most sensitive indicators of global temperature, and most of them are shrinking worldwide (a precious few are expanding, but because of increased precipitation in some areas; their climate is still warming). 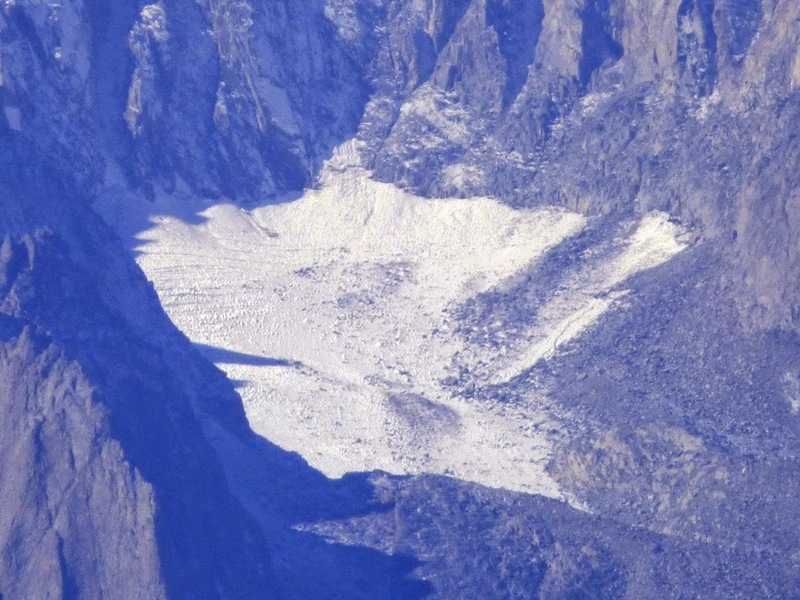 Many or most of the Sierra glaciers will be gone in a matter of decades. 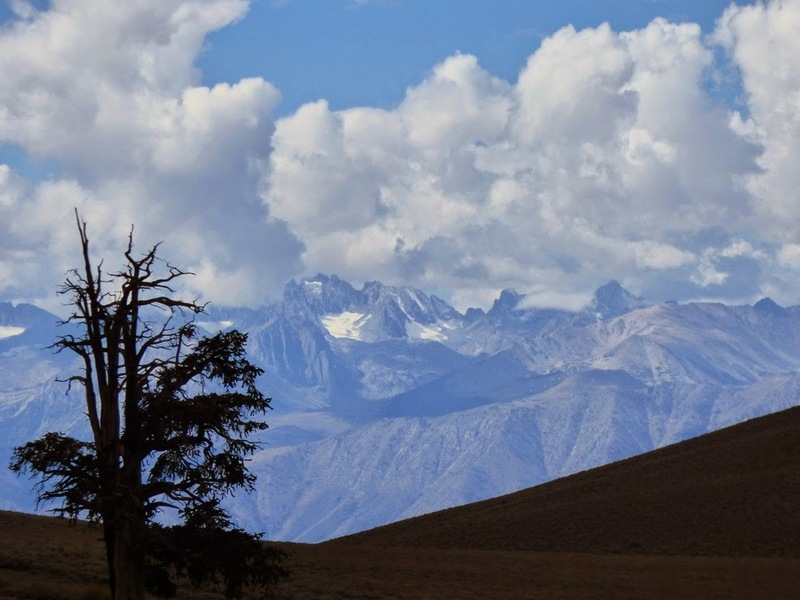 That will lead to some serious changes to the alpine climates of the Sierra, especially as they will no longer be there to provide streamflow during the driest times of the year. It's been a long time since I was able to visit a glacier in the Sierra (it was back in 1982. It was the biggest of the Palisades glaciers, the one in the picture above, and as I stood at the base of the ice, I was able to see the Sierra's youngest natural lake, a tarn produced as the glacier receded. The lake didn't exist in 1950. It's sad that these small reminders of the awesome power of ice will soon be gone. I hope I have at least one more chance to see them up close.